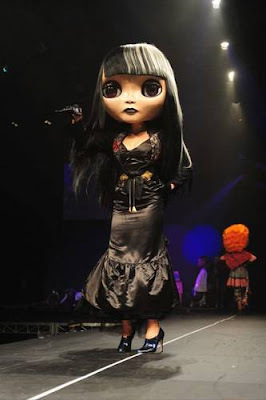 BLYTHE DOLLS! I loooove these things! If i brought one of those home, my Mom would question my sanity. Unfortunately, I don't think they'd look so good in our living room, anyways . . . VERY FREAKY!!!!! I'm ScAred for life! Are those supposed to be Bratz? It would by way to big for a convinsing disguise lol. is it just me, or are those things bigger than the people? scarier than bratz dolls, in my opinion. Ha. Think of the look on the Jehovah Witnesses faces when you answer the door in THAT. Anonymous @8:09: Fabulous answer! You can stop by my house any time! Another thing to add to my birthday list! GIANT Doll heads..Kinda reminds me of the baby-dolls i used to play with. Especially the eyelashes.